Can You Build a Team Around Russell Westbrook? In the latest episode of the Open Floor podcast, the crew discuss Russell Westbrook's true NBA ranking and stack him up against Rudy Gobert. After a disappointing loss to the Jazz in the first-round of the NBA playoffs, the Thunder face a lot of uncertainty this upcoming summer. Paul George is entering free agency and is already facing rumors that he could join his hometown team, the Los Angeles Lakers. Carmelo Anthony has already debunked any situations that would lead him to a bench role. Then there is the reigning MVP, Russell Westbrook. 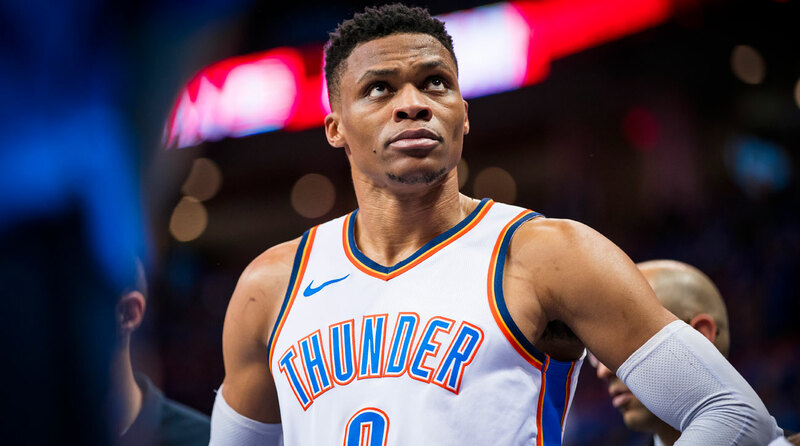 While Westbrook averaged a triple double for the second consecutive season, Oklahoma City did not live up to expectations and now must answer several questions this offseason. Can a team build around Russell Westbrook? That one sticks out from the rest and the Open Floor podcast crew discusses Westbrook's NBA tier, if they would take Rudy Gobert over him and players who can coexist with him. Andrew Sharp: Who will be ranked higher in next year's Top 100? Russell Westbrook or Rudy Gobert? ​Ben Golliver: It's a very tricky question. But what I would say is this: In the individual matchup, Gobert is the exact player you want against Westbrook's specific skillset. Because so much of what Westbrook wants to do is going to the basket and Gobert totally takes that away. It just changes him as a player. So I think in this particular matchup, Westbrook looks about as bad as he could against any random team, whereas Gobert looks about as effective and impactful as he does against virtually any other team. This is why I am going to be looking at this Houston team carefully, because he's not going to be an accessory to the action, but if Houston is going to be able to score a lot consistently with him on the court, I think perception of Gobert as a more valuable overall talent over Westbrook will fade a bit but it's a lot closer than people actually think. Personally, who would I rather have to start my team? I will tell you I would take Gobert, but I think in a vacuum I can definitely see arguments for Westbrook. His ability to get to the basket, be relentless and just bring it every single night, that would beat a lot of teams out there. It just so happens not work against this Utah Jazz team—which was well crafted to slow him down. Sharp: I agree with you. I think it is probably going overboard to say Gobert is clearly more valuable but they are in the same range. I wrote about this earlier this year but I think this season was sort of about a market correction for Russell Westbrook, because for the last two years or so he's been mentioned in the Steph, Harden class of definite top five or six guys and I think he is just a tier below that group. I think he is somewhere in the range of the seventh-best player to the 12th-best player in the NBA. That is not where he has been discussed the past few years. It makes more sense to talk about him as an phenomenal individual player who is going to put some limits on your team that complicates his value. Golliver: A couple other points: Gobert's offense is going to be better, more impactful and more consistent than Westbrook's defense so that is one thing to keep in mind, and I think it is easier to build around Gobert than it is to build around Westbrook. Sharp: I agree with that. Golliver: I think in theory, you can have a team that's a contender with Gobert as your best player, and I am of the opinion right now that it would be very difficult or impossible to have a team that is a true contender with Westbrook as your best player, given his inability to address some of his flaws. Sharp: If we are thinking bigger picture, I agree with that—and we talked about this on the last podcast so we don't need to go too much further into it—but I was thinking about it throughout Game 6 and I think we ultimately nailed it at the end of our last conversation as far the think-piece wars and the attacks on Russ. I am conditioned to roll my eyes on some of the efficiency complaints because that discussion often misses the point with players. It shortchanges what makes certain guys resonate and what makes basketball cooler than other sports. I think basketball is about more than just about winning titles or playing the most efficient style. But the specific experience of watching Russ has gotten complicated over the last year or two because, like we said on the last podcast, he can't really evolve. We have lived this story too many times now and we know what the ceiling is and it is not as fun as it used to be. It is like watching a band that makes the same album over and over again and eventually it gets old. I think that is sort of what is happening with Russ, and that is part of why I said in the last podcast that it would be fun to see him in a different context because I don't think it is going to get better from here with the Thunder. Golliver: What changes—besides the color of his jersey—if you put him on a different team? Let's put him on the Knicks and whoever their next coach is, isn't that guy going to have that same look that Billy Donovan has? The only difference is going to be the shade of blue on his jersey. Sharp: Maybe, but I think if you put him next to a point guard and let him play off the ball his game could look a little different, or if you put him with a big that is more creative. It is funny. I have seen a lot of discussions on Twitter about the right guy to pair him with and it's a real bummer, but the ideal guy is definitely James Harden and unfortunately that shipped sailed like six years ago. Golliver: I would actually say the ideal guy is Kevin Durant. But that is the same point. You are saying what would he look like if he played off of a point guard and, wel, maybe that point guard gets traded for pennies on the dollar. What would he look like paired with a skilled big guy? That skilled big guy's most impressive skill would be offensive rebounds. We can talk hypotheticals, but who is going to change more: Westbrook or those teammates? Sharp: Well, it is tough. Have a good summer, Russ. We will revisit this in October.